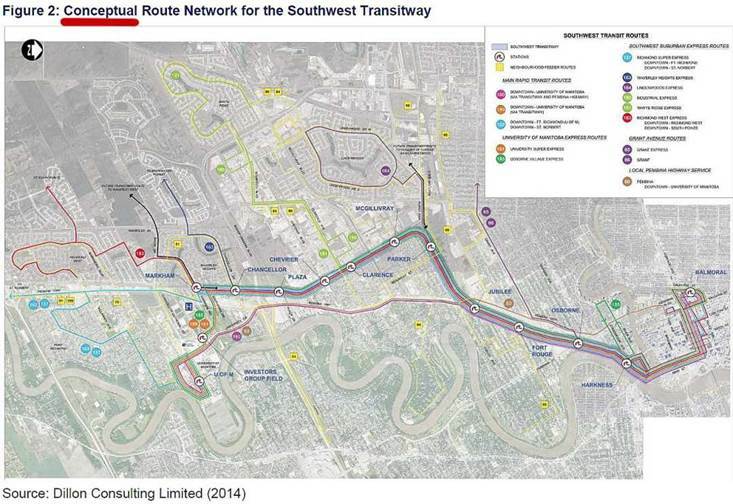 By spring of 2020, the Southwest Transitway is projected to be completed and in operation! For the next year and a half, Transit’s route planners will be reviewing CHANGES to existing transit routes in South Winnipeg. Shorter routes will ‘feed into’ the corridor, opening a wide range of connections and improving the overall transit experience. Taxpayers are investing significant funding to construct the corridor, and it is imperative that this investment be maximized to its full potential. To reach optimization, transit route planners are engaging in comprehensive reviews of existing routes, analysis of areas of growth, both residential, commercial and industrial, analysis of population and demographics, modeling routes, collecting current data and more. City staff are studying the implementation of a ‘high frequency’ transit model. High frequency transit aims to decrease average passenger waiting time at stops, and increasing transit frequency and dependability. A very informative book on called Human Transit (published by Jarret Walker ) speaks in great detail about the benefits of high frequency transit and what cities must do to implement. I was actively involved in bringing Mr. Walker to Winnipeg last year to speak with Transit planners, Council and advocates. Cities across North America are moving their transit systems to the ‘high frequency’ model and are experiencing a significant uptake in citizens using transit.